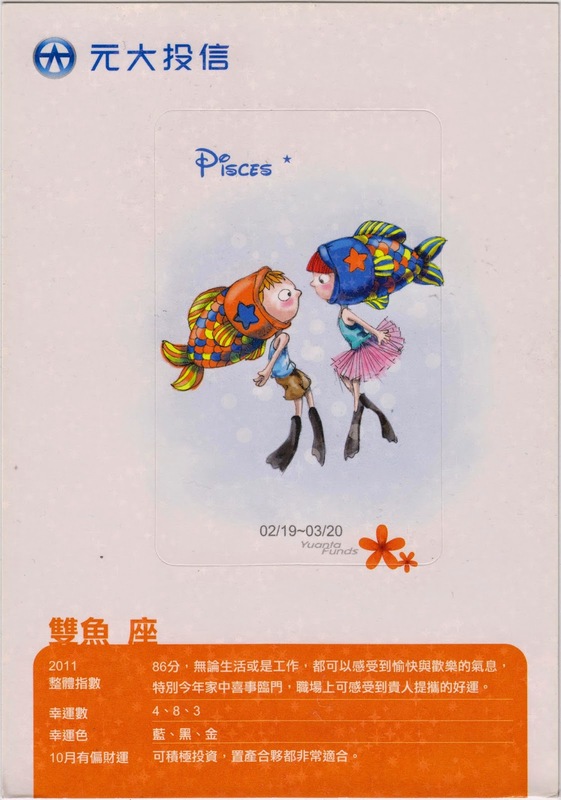 Postcard US-2421441 to Czech was a Horoscope card for Pisces (雙魚座), courtesy of Yuanta Securities Investment Trust Co., Ltd. from Taiwan in 2011. Pisces is the twelfth astrological sign in the Zodiac, originating from the Pisces constellation, which spans the 330° to 360° of the zodiac, and between 332.75° and 360° of celestial longitude. Under the tropical zodiac the sun transits this area on average between February 19 and March 20. A pair of fish dressed in colorful costumes are shown on the card. The symbol of the fish is derived from the ichthyocentaurs, a pair of creatures in the Greek mythology with the upper body of a human, the lower front of a horse, and the tail of a fish who aided Aphrodite when she was born from the sea. The card suggested that the lucky numbers for Pisces were 4, 8, 3 and the trending colors were blue, black and gold.